One of the greatest things that we at Henry Repeating Arms enjoy doing is meeting customer requests. Our customers have made us what we are today, and we'll never forget that. When we introduced our first two case-hardened rifles, in .30-30 Winchester and .45-70 Government, they immediately generated so many responses asking for more options that in 2018 we're answering the calls by giving you a full half-dozen more. We made our initial centerfire reputation with the handgun-calibered Big Boy, so it was a logical choice to expand the steel-framed case-hardened finish into that line-up, and we've got six hard-workin' leveractions here that merge the classic looks of those beautifully-done case colors and octagonal barrels with the practicality of a rubber recoil pad and lighter weight than the original brass models. 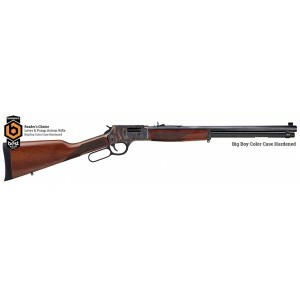 We know very well that no two people agree on the ideal rifle, so we not only give you your choice of Big Boy calibers in .357 Mag/.38 Special, .44 Mag/.44 Special, and .45 Colt, but you can also choose between either a standard 20" barrel and lever, or a compact 16.5" barrel fitted with a large-loop lever for cold-weather gloved use (or just-because style points in general). Both long and short models feature clean checkering on fore-end and straight-wrist stock, our adjustable buck and bead sights, an automatic in-hammer transfer bar safety, and our traditional tube loading.